Santa Claus and UFOs may indeed have something in common. As Michael Shermer shared at TED2010, they are two things that engage the “belief engine” that is also known as our brains. In his talk, “The pattern behind self-deception,” Shermer debunks superstitions and urban legends and shares why we are prone to believe in them — because of our brain’s hardwiring for survival. He explores what is behind our shared desire to believe, even when it means actively deceiving ourselves — and potentially others. Today, TED Weekends on the Huffington Post features Shermer’s compelling talk. Below, find some of our favorite essays that accompany it, taking a look at deceptive tendencies. As the publisher of Skeptic magazine I am often asked what I mean by skepticism, and if I’m skeptical of everything or if I actually believe anything. Skepticism is not a position that you stake out ahead of time and stick to no matter what. Consider global warming: Are you a global warming skeptic? Or are you skeptical of the global warming skeptics? In this case, I used to be a global warming skeptic, but now I’m skeptical of the global warming skeptics, which makes me a global warming believer based on the facts as I understand them at the moment. The “at the moment” part is what makes conclusions in science and skepticism provisional. It takes almost no effort to make a child believe in Santa Claus. Step one? Put some presents under a Christmas tree every year. Step two? Tell the child that Santa Claus put them there. Result? You’ve got a Santa-believer on your hands, and you have evolution to thank for it. 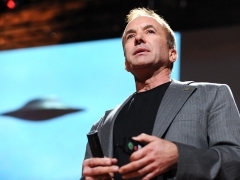 Belief is the topic of science writer and historian Michael Shermer’s TEDTalk on the patterns and Darwinian instincts behind self-deception. Even as a noted skeptic — in fact, as editor-in-chief of Skeptic magazine — Shermer asserts that belief is the natural human state, and that it is science and reason that seem unnatural to us. During his time on the stage, he pulls away the curtain that divides us from our understanding of why we are prone to believe ultimately illogical, at times fantastical, things. In the opening scene of the critically acclaimed film, a title card appears on the screen to raise the possibility that fate has intervened to guarantee that an uneducated orphan from the slums of Mumbai will defy the odds and become a game show champion. Throughout the film the possibility that Jamalʼs quest would end in failure looms large. Ultimately, the sheer improbability of his success suggests the universe conspired to provide a set of questions that he was uniquely suited to answer. In so doing, Jamal was reunited with Latika, his first and only true love, and his romantic destiny was fulfilled. Viewers are left with the sense that something so improbable could not have happened by chance alone, and the underdogʼs fate must have been written in the stars. Indeed, the filmʼs immense popularity is most likely enhanced by its universally appealing storyline: seemingly random and disconnected events are, in some unfathomable sense, intertwined by fate.